What Do You Need to Do if Your Senior Has Fallen? The moment that you learn your aging family member has fallen is likely a terrifying one. But there are things that you can do immediately afterward to help ensure that your senior is unharmed and is less likely to fall again in the future. Make an Appointment with Her Doctor. Even if your aging adult thinks that there’s no reason for her to see her doctor, a fall can leave injuries that she doesn’t know about just yet. It’s worth the time and energy to go to her doctor and verify that there’s nothing wrong. List All Medications and Supplements She Takes. While you’re there, make sure that you list all of the medications and supplements that your senior is taking. Her doctor can cross reference this list and determine if there’s any medication that interacted with another. These types of reactions can certainly contribute to a fall and you need to be aware if any of the supplements or medications your senior is taking should be modified. Determine the Cause, if Possible. Beyond medications and medical causes, there could be other potential causes for a fall. Your senior’s home may have too much clutter or could be in disrepair somehow. 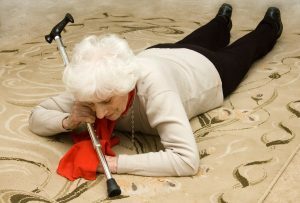 Take a sweep through the house and be sure to ask your senior exactly what happened when she fell. Retracing her steps, both literally and figuratively, can help you to solve what happened. Find a Solution to Prevent a Recurrence. Even if you don’t find the exact cause, you can start to implement some solutions that can help to prevent another fall for your elderly family member. Make sure that there are no physical obstructions, such as clutter or loose flooring, which can cause a fall. Install hand rails so that your senior has something to reach for if she should stumble. All of these can help, but so can hiring elderly care providers. They can not only be alert for various safety concerns, but also for signs of dizziness or other issues facing your senior. Falling even once can be an extremely painful situation for your aging adult. Once you’ve made sure she’s alright, it’s time to do what you can to prevent it from happening again. If you or an aging loved one are considering elderly care in Keyport, NJ, please contact the caring staff at Lares Home Care 888-492-3538 or 732-566-1112.